The Twenty Club Amateur Players of Llangollen are performing The Flint Street Nativity from November 22-24. 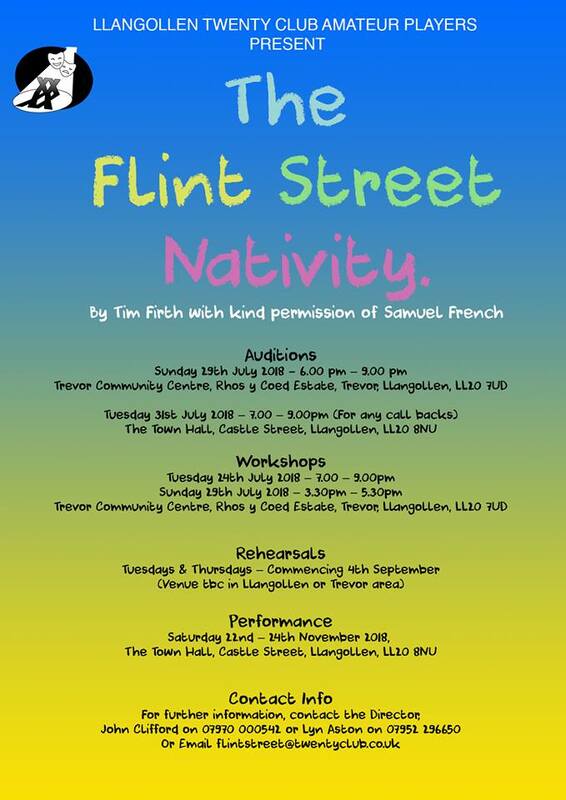 It's an hilarious comedy written by Tim Firth of Calendar Girls fame. The club are holding pre-audition workshops at Trevor Community Centre on Tuesday July 24, from 7-9pm, and on Sunday July 29, from 3.30-5.30pm. Rehearsals will be held on Tuesdays and Thursdays starting on September 4 at a venue in Llangollen yet to be confirmed. You will be invited to join the Facebook page once you have expressed an interest, and the production team will keep you updated on the auditions, workshops and casting of the play. There are seven male and five female characters, all ideally aged 25 – 55. Director John Clifford said: "The performances promise to be of an excellent standard, as expected from The Twenty Club, but also of great importance, rehearsals and the production should be great fun. "We are also looking for new members who may be interested in helping with other areas of the production too. Please get in touch." llanblogger is the new FREE news/comment blog for the town of Llangollen in Denbighshire, North Wales. We would like to include, free of charge, any items of local news, details of local clubs and organisations. We also invite you to comment on stories appearing on the blog.